With 74 players remaining, Liv Boeree was all in for 25,000 at 3,000/6,000 blinds. Action folded around to the big blind who thought for awhile before making the call with [Ts][8d]. Liv held [Qs][Qh] and was in great shape to double up. The [Kd][Qd][Jd] gave Liv a set, but gave her opponent a straight and flush draw. The [As] filled the straight, but Liv had a redraw to a full house. 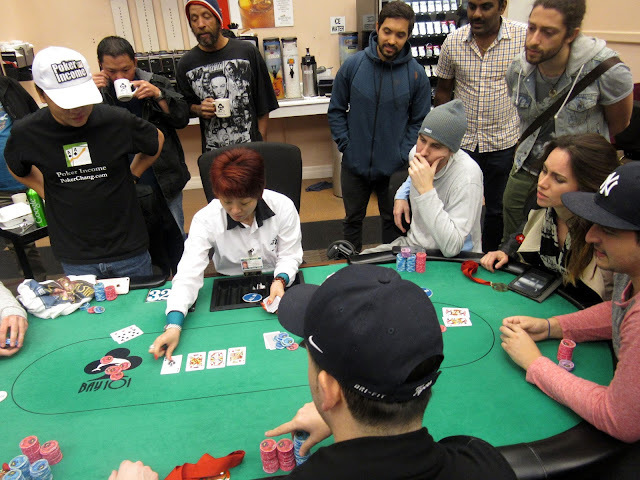 The [Td] landed on the river and it looked to be a chop with a straight on board, but it was quickly noticed that Liv's opponent had rivered a flush. With the elimination of Liv Boeree, play is now hand-for-hand.